Yep, that’s right, it’s time for me to tell ya a thang or two about Baxter’s Original Premium Smoker Wood.. In fact I’m gonna tell about the BBQ Supply Store that these guys have also! A few years ago I met Michael Baxter on Twitter and then ended up actually meeting at the Smokin’ on the Suwanee BBQ competition. We showed up as spectators and he had delivered the order that I placed for a few chunks of wood and I’ve been hooked ever since! I wanted to give ya just a little bit of a back story on how we met so I can lead up to explain what I’ve learned since meeting this guy. There was a time when I thought “Man, wood is wood” and I would throw any old chunk of pecan or oak on the cooker. It didn’t matter to me because it all tasted the same, smokey! Well, after one run of ribs using Baxter’s Original Pecan I immediately realized that everything I had ever thought about wood would forever be changed. I couldn’t believe how much different the ribs were that came off the grill. There was actually a very good smoke flavor to the meat without it tasting, well, terrible. I was hooked immediately and starting using Baxter’s Original exclusively. Let me give ya a little bit of info that I have learned and that will help explain why it is so different. Baxter’s Original never kiln dries their wood, it is cut, cleaned, and racked so that it can be naturally air dried. Air drying allows for the natural sugars in the wood to REMAIN IN THE WOOD, where kiln drying the wood cooks many of the sugars out. The up side of Baxter’s Originals natural drying process keeps those sugars in and allows you to get the most flavor out of the wood when smoking with it. I give ya that little bit of information to lead up to this point. Baxter’s Original has totally changed how I look at smoker wood. When you open the box you can see that they have taken the time to ensure that each piece of wood is clean, and is just the important parts of the wood that you need for optimal flavor. This also ensures that a 20lb box of wood is actually 20lbs of wood… Even cooler, is that when I open a box of fruit wood, like apple, or peach wood, I can actually get the aroma of that fruit. It smells great even before smoking with it. Once the wood is added to the smoker it literally fills the air with a very distinctive sweet aroma that has at times drawn a crowd to the house. 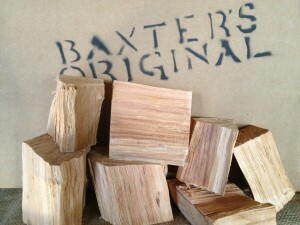 Not only does Baxter’s Original offer wood chunks, but they also offer wood chips. I definitely use wood chips when I’m grilling something like a steak or burgers. The chips help add a subtle wood fired flavor to the meat that really sets it over the top. One of the coolest things about the chips is the time that these guys have spent on packaging. Each flavor of wood chips is labeled clearly so you would have a hard time getting mixed up with what flavor you are trying to use. I mean, c’mon, who doesn’t like some cool packaging that someone put together by hand to ensure that you get the absolute best product that you can buy. There was some serious effort put into each bag of chips, and let me tell you, if you like to grill, there is nothing better than a handful of wood chips added to your coals. All I know, is that over the years, I have come to respect the name Baxter’s Original because I know that I am getting the highest quality product at an extremely reasonable price. Someone at their store hand cuts and inspects every single piece of wood that is shipped out of their store. That means something to me, that someone puts that much effort and care into a product that they send out. 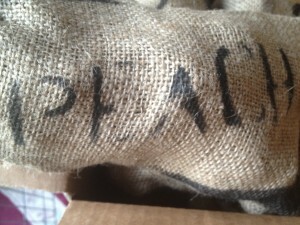 But don’t just take my word for it, check out their website www.BaxtersOriginal.com and order some wood. While you are there, take a few minutes to check out some of their other amazing BBQ products!